Ben Quayle (R-CD3), one of Arizona's three new Reprsentatives in Congress, has picked Renee Hudson to be his chief of staff. Ms. Hudson had been a longtime chief of staff to Rep. Mark Souder (R-Indiana); she confronted him and informed GOP leadership about his adulterous affair, which prompted his resignation earlier this year. The Roll Call story also indicates that Quayle's new press secretary - Richard Cullen - previously worked for Rep. Eric Cantor's Minority Whip office. The basic Indiana connection in the story is obvious, in that Quayle's father represented the state in the Senate (before his term as Vice President). Less obvious: Souder indicates that Dan Quayle had actually warned him years ago that he should move his entire family from Indiana to Washington; that might have helped prevent the scandal which drove him from office. Two other brief related tidbits: (1) Ms. Hudson's husband is the chief of staff for another Republican Congressman, Mike Conaway (R-Texas) (How many two-chief-of-staff-couples exist on the Hill? ); (2) Most chiefs of staff for disgraced/resigned Representatives do not usually get hired in a similar position elsewhere. We have been following the Senate debate on the New START Treaty between the U.S. and Russia, and how Arizona Senators John McCain and Jon Kyl have been part of a shrinking group of Republicans opposing ratification. The final vote took place an hour ago (12:30, Arizona Time), and our Senators found themselves on the short end of the 71-26 vote to approve the treaty. Worth noting, 13 Republicans in the Senate DID vote to approve it, and three others (Brownback, Bond, Bunning) did not vote. We have probably all heard or read about the disagreement between the Phoenix (Catholic) Diocese and St. Joseph's Hospital. Early today, the Diocese revoked its designation of the hospital as "a Catholic hospital". Here is the responsive letter statement from St. Joe's, indicating that - if presented with the same circumstances as the incident in question - it would again "save the life we can save." Arizona Rep. Jeff Flake (R-CD6) appeared on the "Fox & Friends" morning show on Fox News yesterday, and discussed one of his favorite subjects - cutting wasteful government spending. Now that he is on the Appropriations Committee - which "a lot of people thought would never happen. I think Republicans are finally getting serious about spending. But, I'd like to take it further and have an investigative panel - a subcommittee devoted simply to investigating waste and fraud, abuse and these agency grant programs that aren't earmarks from Congress, but (are) just decisions by the agencies to spend money that they shouldn't spend." Arizona's John McCain was one of 14 Senators to vote against a cloture motion. It passed 82-14, allowing a stopgap spending measure to go to the floor. The stopgap will prevent the U.S. government from "shutting down" at midnight tonight. Jon Kyl voted with the majority. Arizona's two U.S. Senators continued to support amendments to the New START Treaty between the U.S. and Russia, even as a few of their Republican colleagues faded. Three more amendments were voted on yesterday, and Jon Kyl and John McCain were among the 33 who supported the 1st two (33-64 with 3 not voting) - and 35 who voted "aye" on the 3rd (35-62). A final ratification vote on the treaty is expected by Thursday. 67 votes (2/3) will be required to ratify, and the votes on the amendments are very close to that threshold. However, of the three Senators who did not vote on Monday's amendments, two are Democrats (Wyden, Bayh) and one is Republican (Brownback). Also, some Republicans may reasonably be expected to approve the treaty after full debate. The census also helps decide how and where approximately $400B/yr in government funds is spent. Interesting (re)apportionment fact: It is not a straight population per capita calculation to apportion the 435 seats in the House of Representatives. Residents of D.C., Puerto Rico, Virgin Islands, Samoa, Guam and Northern Marianas are not counted in the apportionment. Then, each of the 50 states gets one seat. THEN, the remaining 385 are apportioned per capita. Another fact: Between 1990 and 2000, the population of the U.S. increased by 13.2% (to 281.4 million). Arizona Governor Jan Brewer dashed off a four-page letter to U.S. House of Representatives Speaker-Elect John Boehner on Friday (released today). No holiday wishes, but a wish for next year: that the GOP-controlled House eliminate a "spending mandate" for state Medicaid programs, from the healthcare law. Here is how the Arizona Daily Star summarizes it, and the response from Arizona Democratic Rep. Daniel Patterson. Arizona's Politics is preparing a Fact Check on the detailed letter. If you have any questions about any of the claims, or citations for or against them, please leave a comment here or send me an e-mail. Must not have been much of a hearing. The hearing to certify the statewide recount of Proposition 112 was scheduled for 11:45 this morning. At exactly 11:46, Judge Oberbillig signed the order confirming that the measure was defeated, by 194 votes. The measure - referred to the ballot by the Legislature - would have amended the Arizona constitution to push back the deadline to file petitions to put initiatives on the statewide ballot. Debate on the treaty will likely continue over the next few days. Sen. John Kerry (D-MA) is leading the debate on behalf of ratification of the START Treaty between the U.S. and Russia. Moments ago, in urging colleagues to reject an amendment, Kerry noted that a treaty ratification can be unraveled like a sweater when amendments start to pluck away threads. You do not want to become undone. WALLACE: Let me move to another subject. The Senate voted yesterday to repeal "don't ask, don't tell," the ban on gays serving openly in the military. Senator Kyl, you voted against the measure. Do you really think that it is going to hurt the ability of the U.S. military to fight in the two wars they're -- we're currently involved in? And what's the difference between this and racial integration of the military 50 years ago? KYL: Well, from a constitutional standpoint, this is not a constitutional right or a constitutional issue, as was the issue of racial segregation. On the first question, I frankly have to follow the lead of people like the commandant of the Marine Corps, like my colleague John McCain, who say that when it comes especially to the small units who do the fighting on the ground -- the U.S. Marine Corps, the Army combat troops, who, according to the survey taken by the Pentagon, were 60 percent opposed to this -- it could disrupt unit cohesion and, as the commandant said, cost lives. That means a lot to me. WALLACE: What about, though, on the issue of fairness? You point out the Constitution. But on the issue of fairness, what's the difference between this and racial integration? And Lord knows, back then in the '40s there was plenty of objection, and had been for decades, about what this was going to do to the military if you let black and whites serve in the same units. KYL: Well, that may have been, and they were wrong, obviously. But the question of fairness is one which we would deal with in a school or in a community group or in some kind of organization that -- where fairness is a big issue. With regard to the U.S. military, it's got one function, and that is to fight and to fight well and maybe to die. And the people who are responsible for that need to make the judgment about whether this will inhibit their ability to carry out that ultimate job that we ask them to do. And as I said, I look at those who are on the -- who have been surveyed relating to the combat fighting, the units on the ground, not the guy sitting behind a desk here in Washington, but the guys on the ground, and they say this could cost lives. DURBIN: Each political generation has very few, but a few, opportunities to extend justice in America. That was our chance yesterday in repealing "don't ask, don't tell." And I am proud that my political party and eight really strong and courageous Republicans stood up and said, "We'll join you." This should be bipartisan. It is beyond a question of fairness. These are men and women who are willing to risk their lives in defense of their country. And the fact that their orientation -- sexual orientation's been held against them is a blot on our nation's reputation. And I'll tell you this, Chris. This administration, this president, went to great lengths before they moved to implement this. They surveyed and found that 70 percent of those military and families asked said they were prepared to accept this. The number, incidentally, when those in the military were asked about integration some 60 years ago, was 20 percent. This shows me that America has come to a point where it understands that sexual orientation should not be used against you. And honesty in the service of our country is going to make us a stronger nation. The rest of the conversation was also interesting, and worth a watch once it is posted later. Durbin predicted that there will be 67 votes to ratify the START Treaty; Kyl refused to counter-predict. By the way, speaking of the Treaty debate, it is going on live now on C-Span 2, and can be watched online here. The Senators are scheduled to vote on another amendment (regarding tactical nuclear weapons) at approximately 1:00pm (Arizona time). They are running a bit late, though. Also, there was just an interesting discussion about the timing of this debate, cloture motions, and amendments that will be attached to a ratification vote (apparently to advise the administration on post-ratification steps); we may be looking at a vote to ratify late on Thursday, December 23 with lots of stern-sounding advice for the future. Lieberman On McCain, DADT: "We leave this fight knowing that I was right and he was wrong." I have not yet checked out the Sunday morning shows, but it will not be surprising if Arizona Senator John McCain's name comes up a few times. Many have taken notice of his behavior the last few days - regarding the START Treaty, the tax cut extension tension, but most of all, his anger regarding the repeal of "Don't Ask, Don't Tell". This Dana Milbank story in today's Washington Post is a decent wrap-up. P.S. Just looked up the listings for the Sunday shows. Arizona's other Jon is scheduled to be on Fox News Sunday. We will follow up. The U.S. Senate is in action today (compared to the usual inaction ;-) ). Quickly, here are the key votes and how Arizona's two Senators voted. DREAM Act: Senate failed to limit debate, only reaching 55-41 (short of 60). McCain and Kyl were part of the 41. START Treaty, McCain's amendment to take provision out of preamble regarding missile defense: The amendment was rejected, 37-59. McCain and Kyl were part of the 37. The Superior Court hearing at which the recount results on Proposition 112 should be certified is set for 11:45, Monday (Dec. 20) morning. The bit of uncertainty in that lede is because Judge Robert Oberbillig also ordered the counties to finish their portions of the recount by December 15; yet, nothing has been filed in advance of the hearing and there has not been a peep from either the Secretary of State nor any of the county Recorders. Perhaps it is simply indicative of a lack of interest in the proposition, which would amend the Arizona constitution to push back the deadline to file petitions to put initiatives on the statewide ballot. Arizona Senator John McCain spoke on the floor of the Senate at least twice today, as debate around the START Treaty took center stage in the Senate. First, he co-introduced an amendment to remove a clause out of the preamble that notes "the interrelationship between strategic offensive arms and strategic defensive arms." McCain spoke at length about why he is concerned that this could give Russia a "de facto veto" on U.S. missile defense systems. Here are his comments in full. Rep. Giffords was interviewed on set last night by Fox News' Greta Van Susteren. They spoke for approximately four minutes about the Border Patrol Agent killed this week in a shootout with bandits near Nogales, and about the need for more attention to controlling the border. Giffords (D-Tucson) compared Arizona's current border situation to the Gulf Coast oil spill, and suggested that President Obama should follow DHS Secy Janet Napolitano's trail and come inspect the situation on the ground. For some reason, I have not yet seen local sidebar coverage of last night's Congressional vote, indicating how all of our Arizona Representatives voted. The vote was 277-148 to send the Senate package to the White House, where the President signed it today. Arizona's delegation split 4-4, with Rep. Raul Grijalva (D-CD7) joining the three Republicans in voting no. The other four Democrats voted yes. An interesting post by Stephen Lemons at the New Times' site about incoming Senate President Russell Pearce's pre-session fundraiser. Pearce is - as he is entitled to under Arizona law - collecting as many donations from lobbyists and other interested people just before the next legislative session begins. But, just so the record is clear: this "fundraiser" with a host committee of approximately 75 is not designed to help some non-Clean Elections candidate retire a campaign debt from a vigorously-fought campaign. Instead, this is to stuff the future campaign warchest of Pearce and to give people and PACs a chance to express their appreciation to Pearce for the work he is about to do. After all, as of three weeks ago (Nov. 22), Pearce had a cash balance of $66,632.64 in his bank account, with no outstanding debts. (4) Pearce used this campaign account to reimburse himself (on November 5) for airfare and lodging. I would guess that that was for his trip to San Francisco to watch the oral arguments before the 9th Circuit on the SB1070 cases. $551.17. (5) See previous posts about Russell Pearce. ...Kelley Sykes of Scottsdale! She - or, he - won the KJZZ Year End Pledge Drive BIIIIIGGGGG prize drawing of a deluxe trip to Italy. I am NOT jealous! If you are interested in donating to any of Arizona's public radio stations, please check out my initial post on this for links! We have been moving Politico's report about the new radio ads that karl Rove's Crossroads GPS group is airing this week against 12 targeted Democratic Representatives who will be up for reelection in 2012. (It is not pressuring any recently-defeated or retired Dems.) We have already posted the audio and the transcript of the cookie-cutter "She's Baaa-aack" ads. Now, it is time to check the content. 1) Nancy Pelosi is "trying to raise taxes." 2) Taxes "skyrocket" on New Year's Day. 3) "Pelosi is blocking the bi-partisan plan to stop these tax hikes." 4) Could bring back "marriage penalty tax", and hike the "death tax". 5) Would "raise job-killing taxes". TRANSCRIPT: She's baaa-ack. Nancy Pelosi's at it again. Trying to raise taxes while our economy struggles. On New Year's Day, taxes skyrocket for everyone. Unless Congress acts. Even low-income families will see their tax rates increase by 50%. But, Nancy Pelosi is blocking the bi-partisan plan to stop these tax hikes. Her reckless ploy could bring back the marriage penalty tax, and hike the death tax on family businesses, farms and savings. And, whose side is Congressman Gerry Conway on? Will he side with Nancy Pelosi to raise job-killing taxes? Or, with struggling families and small businesses that can create the jobs we need? After two years of bailouts and wasteful spending, enough is enough. Call Congressman Conway at 202-225-1492. Tell him to stand up to Pelosi and demand a vote. It's time to cut spending; not raise taxes. This moment of common sense is sponsored by Crossroads Grassroots Policy Strategies. She's baaa-ack. Nancy Pelosi's at it again. Trying to raise taxes while our economy struggles. On New Year's Day, taxes skyrocket for everyone. Unless Congress acts. Even low-income families will see their tax rates increase by 50%. But, Nancy Pelosi is blocking the bi-partisan plan to stop these tax hikes. Her reckless ploy could bring back the marriage penalty tax, and hike the death tax on family businesses, farms and savings. And, whose side is Congressman Gerry Conway on? Will he side with Nancy Pelosi to raise job-killing taxes? Or, with struggling families and small businesses that can create the jobs we need? After two years of bailouts and wasteful spending, enough is enough. Call Congressman Conway at 202-225-1492. Tell him to stand up to Pelosi and demand a vote. It's time to cut spending; not raise taxes. This moment of common sense is sponsored by Crossroads Grassroots Policy Strategies. As we just posted, Politico is reporting that Arizona Rep. Gabrielle Giffords (D-Tucson) is one of a dozen newly-(re)elected Democrats being targeted by a $400,000 radio ad. Now, you can be the first to hear what selected Tucson radio stations will be spinning within the next few days. While Crossroads GPS has not posted anything on their Twitter, Facebook or website yet, they have posted audio of the ad on their YouTube channel. (At this moment, it has "8 views", three of which are mine.) It mentions one of the other targeted Congresspeople, but comparing it and the quotes in the Politico article lead me to the conclusion that they are using the same ad against all 12. Embedded audio after the jump. Enjoyed your six weeks with no political attack ads on the radio or TV? Hope so, because the break is over. According to Politico, Karl Rove's Crossroads GPS group is starting to run radio ads in Tucson this week, attacking newly-reelected Gabrielle Giffords (D-Tucson). It is part of a $400,000 campaign targeting 12 congressional districts around the country, in which last month's elections were very close. While Crossroads GPS did not spend any money in CD8, it did help coordinate much of the GOP-philic outside spending campaign in the Giffords-Kelly race (and others). Also of note: this is not a very big expenditure when put in context of the $1.1M of independent expenditure dollars poured into the Giffords-Kelly race alone; it is certainly more of a "send a message" campaign. Please watch this space for audio of this new ad, as well as a Fact Check. We garnered a few good responses last week when we plugged KJZZ's End of Year Fund Drive and the deluxe trip to Italy they were dangling as an incentive. We also promoted several other NPR and public stations around the state. Well, the fund drive closed (though you can still pledge to any of the stations), and the results are in. KJZZ reports raising more than $470,000 last week, from more than 6,000 listeners. Very good results - especially coming pretty soon after their Fall Fund Drive. Rep. Flake Takes Offense; Puns Will NOT Stop... Even If Earmarks Do! On Sunday, the Arizona Daily Star bemoaned ("Sigh. No More Bad Puns") the demise of the Rep. Jeff Flake (R-Mesa) pun parade. The political reporters even believed that an earmark ban will mean that he is "out of new material, even as he takes a seat on the House Appropriations committee and pushes for a new subcommittee dedicated to identifying potential cuts." Not so fast, fellow media member pun connoisseurs (and other pun fans). Flake must have taken it as a challenge, because the very next day, his office put out a press release comparing the weight of the snow that collapsed the Metrodome roof to the weight of our national debt represented by $100 bills (which is crushing taxpayers). Flake's comment: "We’re $13 trillion in debt…now that’s an offensive line." Not his punniest, but a pretty clever analogy. By the way, some are not sure that the voluntary earmark ban promised by the incoming GOP majority in the House is going to hold. Either way, methinks that nothing will hold back the irrepressible punnyman from Arizona. I only caught the tail end of the launch conference for the new multi-partisan(?) organization called "No Labels". Saw journalist Bob Franken do a quick, praising wrap. Checked out the website, the speakers I had missed, the declaration, the whole nine yards. The new group's declaration is easy to like, hard to take offense at. (It is reproduced in its entitety below the jump. "The vital civil center" is where No Labels intends to operate, to move our country forward. An organizer "interviewed" by Bob Franken at the end noted that more than 15,000 people hit the website during the conference and at least 6,871 have signed their declaration. I was one of those, but it remains to be seen whether (a) enough other Republicans will join this effort, and (b) organizers will be able to build more momentum than that. Whatever happens, efforts like these can only better the current political climate. That smarts! I do not usually get a chance to see "30 Rock", though I am sure that I would like it. So, I just saw this video clip after seeing Republic reporter Pat Kossan's (@pkossan) Tweet about it. If you're a UA fan, you'll appreciate this slam. If you support Arizona State - or, just Arizona's reputation - you will wince. And, maybe even howl. Not sure how I missed this news a few weeks ago, but I am very happy that the New Times posted this followup today. Quick summary: Dave Talley, a homeless man living in Tempe, finds backpack at light rail stop. He - with help from folks at non-profit Tempe Community Action Agency/Interfaith Homeless Emergency Lodging Program (TCAA and I-HELP) - discovers about $3,300 in cash and tracks down owner. Story makes news nationally. Tempe honors him yesterday with "Dave Talley Day", and the light rail folks give him free passes for the coming year. Besides the message of integrity that Dave Talley has unwittingly given us all, this has given an opportunity to spotlight the private programs that people in Tempe have pioneered to assist Mr. Talley and other homeless (or near-homeless) individuals. Both the TCAA and its I-HELP program have done a fantastic job of getting local faith-based congregations and members of those communities involved in providing humanitarian services. Personal note: I have participated in I-HELP's programs on a number of occasions over the past few years. I do not believe that I met Mr. Talley any of the times that we have served meals through the program, but I can say that the people who I have spoken with are among those who definitely deserve a better shake from life; with programs like I-HELP, Project Homeless Connect, and others, the chances for that better shake are much better. More than any other posts I have made on this blog, I hope that you will consider forwarding/Tweeting/e-mailing/Facebooking/whatevering this post to your friends/family/contacts/Tweeple/whoever. Dave Talley, I-HELP, and others, thank you. OK. After passing on the Associated Press' short blurb about the judge's ruling denying Maricopa County's motion for a protective order surrounding the video depositions of Sheriff Joe Arpaio (and others), I needed to check out what the judge and attorneys had to say about this. It was worth it. Snow does say that the County can re-file a motion with the arguments in the reply if they comply with the conferring provisions of the rule. Then, the one sentence denial. Defendants hereby request that this Court order the videos of the reopened depositions of (Arpaio, Hendershott, Sands, MacIntyre, others) be protected from disclosure to the media until after the trial of this action. It is has (sic) come to undersigned counsels' attention that the video of the original deposition of Sheriff Arpaio was broadcast shortly after the deposition was held. The trier of fact is the federal judge in this lawsuit and not the media. And, I mean, JUST this. That was the entire motion for a protective order. Unbelievable, in that it did not even pretend to comply with the requirements for a motion for a protective order. Unbelievable in that in that only sentence of argument (the last sentence), attorney Thomas Liddy is really acknowledging why a protective order is NOT necessary: the judge is the trier of fact - not a jury - and Snow is not going to be influenced by some clips on the 10pm news. After plaintiff's response, Liddy gets around to trying a better argument (while still not acknowledging the failure to "confer" to resolve). He states that the media - and "political actors" - can cherry-pick out of context clips, including some dealing with "improper queries" that the Court has not yet ruled on. He also states that the deponents' personal information will be improperly disclosed without redactions and that private citizens' correspondence may also be disseminated. Before you see the video of Arpaio on TV or on the New Times' website, though, you can expect some new efforts by the County to resolve the matter with the plaintiff. If they do not agree on guidelines quickly, Liddy will probably file a new motion for a protective order. Though, based upon the initial lackluster effort, he may not really believe in it enough. We will soon be able to watch the entire video of depositions of Maricopa County Sheriff Joe Arpaio. Federal judge Murray Snow has denied the Sheriff's motion to keep the video private, according to the Associated Press. Any predictions on the numbers of "I don't recall's" or "I'm the Sheriff's"? Last week, we followed up on Cronkite News Services' article about the Arizona Clean Elections Commission meeting, and tried to move it forward. Both articles focused on the proposed rule change on assets purchased by candidates worth more than $200. It was reported that the proposed tweak would be reconsidered at the January 27 meeting; we noted that the 60-day public comment period would end slightly past the meeting. The newly-revised proposed rule IS now up on the Clean Elections website and is open for comment until February 7. The Commission confirmed to Arizona's Politics Thursday afternoon that it has been pushed back to the February 17 meeting. The new proposed rule is now available for review on the website (also below), and the link to comment is up, too. In the previous post, I offered some possible options, and urged everyone to offer their comments. Those comments (obviously) still hold. The only additional ones I came up with today are only to clarify a couple of the clauses. Again, I encourage you to submit comments to the Commission, as well. (Arizona's Politics tried to pay close attention to the flow of national spending in Arizona's competitive congressional races during the campaign, through our "Following Money In Arizona's Politics" series. Congressional District 5, encompassing much of eastern Maricopa County, received quite a bit of that attention throughout the general election campaign. In fact, the negative ads and outside spending started before the ink on the primary election results was dry. Everyone expected a tough rematch battle between Democratic incumbent Harry Mitchell and Republican David Schweikert. The outside spending on the Schweikert/Mitchell race began quickly with the 60-Plus Association's ad attacking the Democratic incumbent on healthcare reform ruling the airwaves at first. The Democratic Congressional Campaign Committee ("DCCC") responded, the National Republican Congressional Committee ("NRCC") entered the ring a few days later, and the air war accelerated right up 'til the last vote dropped. The final total for outside groups ended up in Schweikert's favor, $1.7Million to $1.5Million. However, if you remove homegrown outside money - the Arizona Republican Party ($84,998) and John McCain's committee ($80,472) - the national independent expenditure money was virtually even. This is also reflected in the DCCC vs. NRCC numbers - $1,179,157 vs. $1,145,283! Going to bat for Schweikert were: the Club For Growth ($153,284), the SuperPAC for America ($89,794), $52,224 from the NRA, and $35,292 from the American Academy of Ophthalmologists. (Didn't see that one coming, didja?) The 60-Plus Association spent $19,251, National Right to Life dropped $13,039, and Revere America kicked in $1,302. The close contest in outside money spent was also reflected in the spending by the candidates' committees themselves. Adding in their disbursements, nearly $3.8M was spent by Mitchell or on his behalf, compared to $3.3M by Schweikert or on his behalf. BOTTOM LINE: It was a great win for Schweikert and the Republicans. Like Gosar in CD1, Schweikert enjoyed an advantage in outside money spent on his behalf; however, unlike his new colleague, Schweikert was outspent by the incumbent/on his behalf. Nevertheless, his victory margin exceeded Gosar's. This was the most expensive congressional campaign in Arizona (maybe even including the Senate race, after all is picked through), clocking in at slightly over $7.1 Million. Still, Schweikert went into debt ($530,000, all but $30,000 to himself); more on that to come. *The 8.8% spread in favor of Schweikert was less than the average margin of victory for the statewide GOP. Most of us (readin' or writin' this blog) get our news and analysis from a number of sources. While I am honored that Arizona's Politics may be one of those places, it pales in comparison to the value that we receive from our public radio stations. Phoenix' public radio - KJZZ 91.5FM - does a great job of adding in-depth Arizona news coverage to the NPR programming. And, if you have not already made a pledge to their year-end fund drive, their contest to give one supporter a deluxe vacation to Italy should get you clicking/calling there immediately. Pledge and enter before 6pm tomorrow (though you might want to make sure you do so during one of the many hours that they are offering entries into the drawing). Remember, those contributions may be tax deductible. Regardless, they sure help add to the news landscape in Arizona! Following up on my earlier post of the official transcript of today's oral argument before the U.S. Supreme Court on the Arizona employer sanctions law - as well as the Associated Press analysis of the arguments - here is a wonderful firsthand account from what has become the definitive news source on the Supreme Coutr: SCOTUSBlog.com. Lyle Denniston believes it is virtually certain that Arizona's law will be upheld, either on a 5-3 or 4-4 vote . (Justice Kagan recused herself due to her previous position as Solicitor General.) If it is a tie vote, the law is upheld because it does not overturn the 9th Circuit's decision, but it cannot be used as a "national rule". Barring whatever NPR's Nina Totenberg files this afternoon, this is likely to give you the best "you are there" perspective on this morning's arguments. At least until the court releases the audio. Today, the Supreme Court (of the U.S.) heard oral arguments on the legal issues surrounding Arizona's employer sanctions law - the law that permits the suspension of business licenses of companies knowingly hiring workers in the United States illegally. The Associated Press reporter who attended the argument concluded (in his or her lede) that the Court "appeared likely" to uphold the law. I have not yet had a chance to review the transcripts to see if I reach the same conclusion. But, I know that most who occasionally view this blog are interested in this case and in checking out the transcript. Here is a link to the Supreme Court's official (subject to final review) transcript. If you find things that you think the rest of us should check out, please comment below and we can start our own useful index! Arizona's Politics tried to pay close attention to the flow of national spending in Arizona's competitive congressional races during the campaign, through our "Following Money In Arizona's Politics" series. Congressional District 7, encompassing much of southern Arizona, received quite a bit of that attention in the last three weeks. It was supposed to be a walkover for Democratic incumbent Raul Grijalva as he defeated political newcomer Ruth McClung. After a couple of weeks of Republicans talking up the race as possible upset material, the GOP-philic groups started putting money into the race. 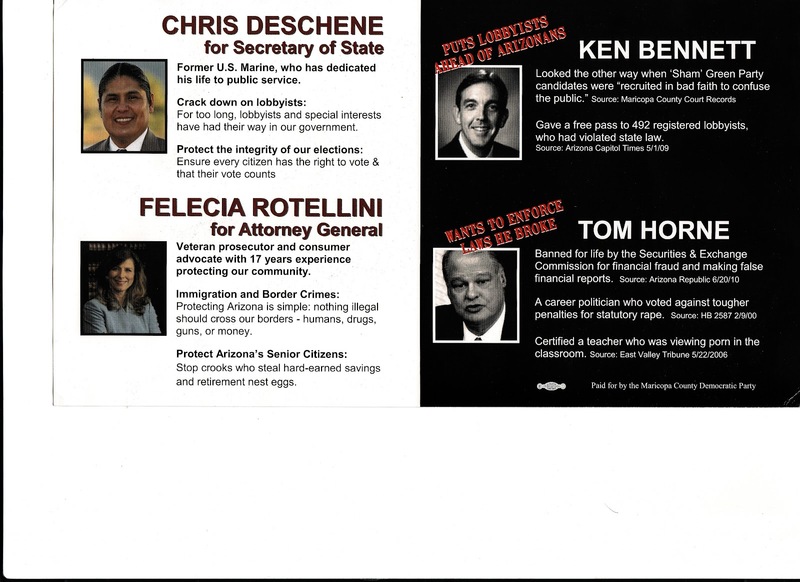 On October 15, Arizona's Politics documented the first (and biggest) salvo, by "Americans for Tax Reform." That set the wheels in motion for more attacks and counter-attacks. CD7 is the second in our series of post-election reviews of where the money came from. (Most of the information is collected from the Center for Responsive Politics - which compiles the required FEC filings. However, totals here may differ from CRP's due to occasionally-confusing coding by the outside group's filings; Arizona's Politics has attempted to catch those (in? )advertent errors. One more note: outside spending reports should be FINAL, as Independent Expenditure groups were required by law to file with the FEC within a day or two of spending; however, post-election reports from the candidates are not yet due. We will produce a final report to include ALL spending on each campaign. Independent expenditures supporting and opposing the candidates in CD7 only took off in the last 2 1/2 weeks of the campaign. When the dust settled (and the mud splatted), Democratic incumbent Grijalva was the beneficiary of $850,000 of outside spending, and Republican challenger McClung watched as $586,000 was spent on her behalf. As noted above, Americans for Tax Reform threw the opening fistful (of dollars, of mud) when they spent $230,184 to run a TV ad in the Tucson market titled "Working" (watch). Arizona's Politics Fact Checked it out at a respectable "B+" (which earned some criticism). The much-discussed U.S. Chamber of Commerce added $161,215 opposing Grijalva, and Sen. John McCain jumped in late with $102,962 worth of advertising and robo-calls. Other Republican-philic IE committees involved were: Americans for Limited Government ($22,499), FreedomWorks ($24,534), and Protecting America's Retirees ($29,560). Smaller actors were: 60-Plus Association ($6,606), Susan B. Anthony List ($2,933), Revere America ($2,901), the NRA ($1,482), Independent Women's Voice ($1,414) and the National Right to Life ($19). The cavalry riding in for Grijalva was led by the Democratic Congressional Campaign Committee ("DCCC") ($178,154), America's Families First ($302,592), and MoveOn.org (Spanish-language ad) ($145,605). Behind them were several groups that seemed to devote some of their resources to paying staffers working on Grijalva's behalf: Campaign for Community Change ($108,245), SEIU (union) ($65,000), League of Conservation Voters ($29,725) and Defenders of Wildlife ($18,136). Smaller actors were: Blue America PAC ($1,998), the Humane Society of the U.S. ($54) and the Sierra Club ($10). One other interesting note: according to the Center for Responsive Politics, 72% of the GOP IE money in this race came from groups that do not disclose their donors. In light of the Supreme Court Citizens United decision, that money can come from corporations. Only 26% of the Democrat IE dollars came from such groups - and 1/3 of that was from undisclosed union members, not corporations. BOTTOM LINE: This was a fascinating close-up look at a successful effort by one party to "expand the playing field" and forcing the other to spend money defending a previously-seemingly-safe seat. Yes, of course Grijalva opened the door with his support of an SB1070-related boycott, and the national climate made it an easy call for the GOP. But, the Republican-philic groups spent just over half-a-million dollars and prompted the Democrats (and Democrat-philics) to pour in $850,000 that they would have preferred to spend elsewhere. And, although the final figures are not yet in for candidates' committees' spending, it is likely that Grijalva enjoyed nearly a 2-1 spending advantage over McClung. Yet, he barely collected a majority of the votes. We welcome your comments about this post. Or,if you have something unrelated on your mind, please e-mail to info-at-arizonaspolitics-dot-com. Thanks. As Arizona junior Sen. Jon Kyl's staff puts it, in his segment on Fox News last night, the Senator "explains... the games being played by congressional Democrats...." Actually, the staff got it a bit more accurately when they titled the video "Inside a Game of Chicken" - because it takes two (at least) to play "chicken". Kyl spends the first part of the interview mocking the Democrats (prodded by host Greta Van Susteren) for having the votes in the House and the Senate before they can "get serious about negotiating". He finally tells Greta that he is - against his usual inclinations - defending the President in holding the meeting earlier this week, and that he understands why the Democrats have to hold these votes before they can negotiate. He then ruins the possible we-can-compromise moment by reiterating that while the Democrats will be ready to negotiate next week, the Republicans won't budge. "Game of Chicken", indeed. By the way, Greta did try to get Kyl to budge off his line by noting that, in fairness to the Democrats, the GOP Senators have already written a letter saying they wouldn't budge. As for the START treaty, Kyl is trying to soften the picture a bit by stressing that there will not be any harm to national security if it does get pushed back (because of the Democrats' tax cut extending delay) to next year. The Arizona Clean Elections Commission held their regular meeting yesterday. As reported by Alyssa Newcomb from the Cronkite News Service, the Commission put off voting on a proposed rule change (current rule below) to require participating candidates to dispose of any computers or other assets costing more than $200, purchased with clean elections monies. The Commission tweaked the proposed provision to give candidates 30 days after the election to either purchase the property for 1/2 of the original purchase price or to turn the item(s) into the Commission (for sale as state surplus). The new proposed rule will be published shortly on the Commission's website and be open for comments for (about) 60 days (until their Jan. 27 meeting, which is only 56 days away - comment early). HOUSEKEEPING: Your Reactions Solicited. Revised. I am still new to this blogging thing. And today - thanks to one of those "tips" that websites often flash on the screen - I learned how to edit that annoying "reaction" thing at the bottom of each of my posts. I hope you will now feel more comfortable clicking one of the reaction buttons and/or leaving a comment. The "reaction buttons" had given you the choice of evaluating my post as "interesting", "cool" or "funny". As far as I know, they were universally ignored on this blog; while the 1st button hopefully was relevant to some, I doubt anyone would tell me that they thought the posts were cool or funny. So, now, you can choose between "interesting", "awful post", "great post", or simply "thanks". I don't think they require a log-in/registration/etc, so click away. Of course, I hope you'll also "drop a comment" explaining your reaction. The several interactions that I have had in the past few months have been enjoyable, instructive and welcome! So, thanks again for reading! And, thanks for reacting and commenting! I coulda and shoulda written this last night. After all, I was wired for a few hours after watching the ASU-UA "Duel In the Desert" on ESPN. (Witness the time stamp on my previous post.) And, I did speak with one of my kids about it in real time as I was trying to hear about the "Return of Lebron" (it ties in, naturally). As the exhilaration and frustration of a classic 4th quarter and 2 OT's started to die down, the several post-game displays of good sportsmanship from both squads brought the exhilartion back. There were head coaches Stoops and Erickson - who had been so (entertaining and) menacing during the game - leading the way with what looked like a heartfelt exchange of good wishes. There were players from the losing team congratulating their opponents, and the winning players consoling their opponents. There was UA quarterback Nick Foles waiting patiently off-camera for ASU Head Coach Erickson to finish his interview with ESPN to give him a congratulatory embrace. And, all of this caught on national TV. My kids and I noted all of this, and I felt compelled to explain that it is special because the UA-ASU rivalry has always displayed sportsmanship - but, that it is often BAD sportsmanship. Having lived in both Tucson and Phoenix, having worked and/or studied on both campuses, having attended or watched UA-ASU rivalry games (in many sports) for some 40 years (with some good interactions with other fans and some that were pretty damned nasty), and raising our kids to favor one of the schools while not dissing the other, last night will hold a VERY GOOD spot in my personal chronicle of the rivalry. And, I hope it will be so for my kids, as they play team sports and choose between fine institutions of higher learning. If you still are missing the connection, well, unfortunately, you are probably part of the problem. UPDATE: I received a nice response from Steve Peoples (the Roll Call reporter) indicating that they WILL be putting the numbers into fuller context with IE groups, later today. I'll link it here when I see it. Thanks, Steve. Roll Call tonight posted the final figures on the spending sprees by the Democratic Congressional Campaign Committee ("DCCC") and the National Republican Campaign Committee ("NRCC"). The spending figures had been about even until the last five weeks of the campaign, when the DCCC borrowed to heavily outspend their GOP counterpart. Check here for all the figures. What I do not understand is how the reporter can note that the NRCC/DCCC figures do not include spending by the parties' Senate campaign committees (NRSC, DSCC) and the parties' national committees (DNC, RNC), but NOT mention the Independent Expenditure groups that poured in extra millions - especially on the GOP side. Arizona's Politics tried to pay close attention to the flow of national spending in Arizona's competitive congressional races, through our "Following Money In Arizona's Politics" series. Congressional District 1, encompassing much of northern and eastern Arizona, received much of that attention. It featured a competitive district and a vulnerable Democratic incumbent. Political newcomer Paul Gosar won the Republican primary and defeated Ann Kirkpatrick in the general. The official canvass shows that the final tally was 112,816 (49.7%) to 99,233 (43.7%), and the Libertarian candidate Nicole Patti pulled 14,869 (6.5%). CD1 begins our series of post-election reviews of where the money came from. (Most of the information is collected from the Center for Responsive Politics - which compiles the required FEC filings. However, totals here may differ from CRP's due to occasionally-confusing coding by the outside group's filings; Arizona's Politics has attempted to catch those (in? )advertent errors. One more note: outside spending reports should be FINAL, as Independent Expenditure groups were required by law to file with the FEC within a day or two of spending; however, post-election reports from the candidates are not yet due. We will produce a final report to include ALL spending on each campaign. CD1 became a battleground district between the two major political parties early in the campaign cycle. No matter who came out of the crowded GOP primary, it was nearly a given that the National Republican Congressional Committee ("NRCC") and the Democratic Congressional Campaign Committee ("DCCC") were going to spend big (especially for a relatively rural district). The final numbers show that both went over the million dollar amount, and the NRCC outspent the DCCC by more than $300,000 - $1,395,876 to $1,067,757. However, other than a nominal $436 from the UFCW (union) and $32,668 from "Women Vote!" (EMILY'S List), no other outside money was spent supporting Kirkpatrick (or opposing Gosar)! On the other hand, Gosar benefitted from major advertising and polling (which no doubt helped drill down on potential supporters) assistance from the American Dental Association - $189,792; Gosar is a dentist by profession. But, more than that, Gosar benefitted from three-quarters of a million dollars ($777,332, to be exact) spent by an apparently-coordinated network of conservative groups. Most of that money was spent on television and radio advertising in the Flagstaff and Phoenix markets. Yesterday, Arizona Sen. John McCain continued his campaign to keep the U.S. military's "Don't Ask, Don't Tell" policy regarding homosexuals in the military in place. He criticized the Defense Department's report in an interview with NBC. In the "brief interview," he again downplayed the opinions of military service members, the Commander-in-Chief (Obama), the Secretary of Defense (Gates) and the Chairperson of the Joint Chiefs of Staff (Mullen); instead, McCain played up the opposition to the repeal of the Commandant of the Marine Corps (Conway/Amos) and the concerns expressed by other branch chiefs. Unfortunately, McCain was flat out wrong. Gates was a 2nd Lieutenant in the U.S. Air Force (when he was beginning his long service in the CIA). Reached by Talking Points Memo, McCain spokesperson Brooke Buchanan claimed in an e-mail that McCain "simply misspoke," and that "obviously Senator McCain is aware of Secretary Gates' many honorable years in service." It does not seem "obvious" from the quote. It does seem that McCain was focused on the "political appointee" aspect of Gates' current position and had it locked in his brain that Gates' credibility could be diminished along with anyone else who believes that DADT can be repealed.